Located on Vashon Island, Washington, Lollar builds more than 50 different varieties of pickups, including original designs and vintage reproductions, for a variety of instruments. 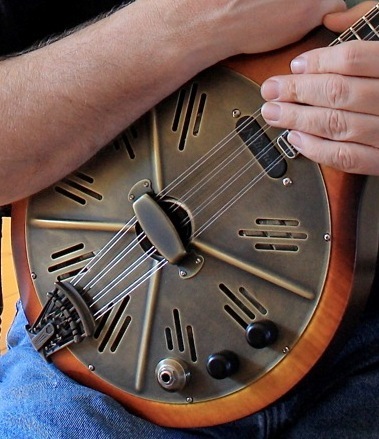 He developed a a "hot plate" pickup for National guitars, built on a 10-inch cover plate. Now he's designed a 9.5-inch version for installation on National mandolins, and here it is installed on a recent RM-1. (I have got to get me one of these!) Visit Jason's Web site for more information.